Tulum is a laid-back but beautiful beach town on Mexico’s Yucatan Peninsula, situated some 80 miles south of Cancun. It marks the southernmost boundary of the region known as the Riviera Maya (the area to the south of here is known as the Costa Maya). While Tulum is cherished for its gorgeous beaches and upscale hippie vibe, the town is probably most famous for its impressive Mayan archaeological site, set dramatically on a clifftop overlooking a stunning stretch of turquoise ocean. 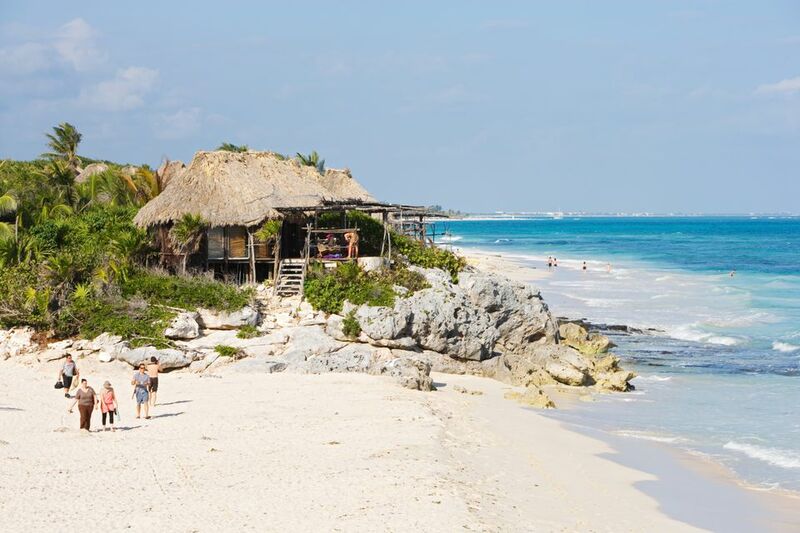 Tulum is divided into two distinct areas: the lively, if rather scruffy, main town center is set right beside the highway, while the hotel zone, or “Zona Hotelera,” is located on a more secluded stretch of jungle and beachfront leading towards the Sian Ka’an Biosphere. While many travelers don’t linger in Tulum after visiting the ruins, they’re missing out: it’s well worth spending a few days to soak up the relaxed, eco-friendly vibe, stunningly wild beaches, and excellent dining, drinking and spa opportunities. Explore the ruins of Tulum (open 8am-5pm daily), a cluster of Mayan structures from the Postclassic period whose relatively modest design is more than compensated for by its unforgettable setting overlooking the ocean. Be sure to take a refreshing dip in the sea after exploring the site. There are steps leading down to the beach -- bring a towel! Take a day trip to Sian Ka’an, the spectacular nature preserve declared a UNESCO Biosphere, for outstanding wildlife viewing, bird watching and swimming in the clearest waters you’ll ever experience. Swim, snorkel or even go cave diving in cenotes, the system of underground rivers found beneath the Yucatan Peninsula. Visit the Gran Cenote, on the road to the Cobá ruins, where you can snorkel in the caverns, or for a more memorable day out, arrange a tour with a local outfit like AllTourNative, who can arrange excellent guided tours to little-visited spots. Rent a bicycle and explore the entire stretch of beachfront. Cancun's international airport (Airport code CUN) is the main point of entry for the Riviera Maya. Tulum is around an hour and a half drive south of the airport. Take an ADO/Mayab bus to Playa del Carmen, then transfer to Tulum bus or collectivo. Take an ADO bus to Cancun City Bus Terminal, then a bus to Tulum. Rent a car to explore the area independently. Unlike some other areas of Mexico, roads in the Riviera Maya are in good condition and well-marked.